Cities in this century are fastest growing with increase in urbanisation. Rapid urbanisation is increasing multiple challenges for urban management in developing country. Many of the developing countries still lack adequate housing options for adjusting migrated people. So in the cities with no or very less housing options people go towards the slum formation. Slum is place with lack of or insufficient basic services and infrastructure like water, electricity, road etc. 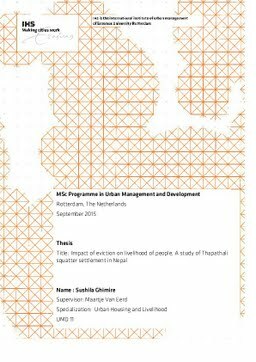 Another urban management issue in cities is the squatter settlement. Squatters are people living in public or private land without having any legal tenurship. People squat when they have no options to settle legally and also lack adequate livelihood assets. Mostly squatter settlement lack basic services as well as infrastructure. Such settlement is usually found in unhygienic and vulnerable areas where the government and other have low focus. For example squatter settlement can be seen in river bank, side of railway tracks, around waste disposal sites etc. Squatters usually lack adequate assets to diversify and enhance their livelihood; they try to manage their living with whatever assets they have. Even though squatters settle in unused places with lots of risk in many cities such settlements has been demolished. The major reason of eviction in many cases is the illegality with no land tenurship. Eviction of squatter settlement in itself is not a solution for city to avoid illegal settlement. If the eviction is unplanned and without proper relocation plan squatters are again forced to squat at another place and form a new squatter settlement. Eviction instead makes the poor squatter more poor by losing the livelihood assets. Such squatters are always compelled to cope with whatever assets they hold.